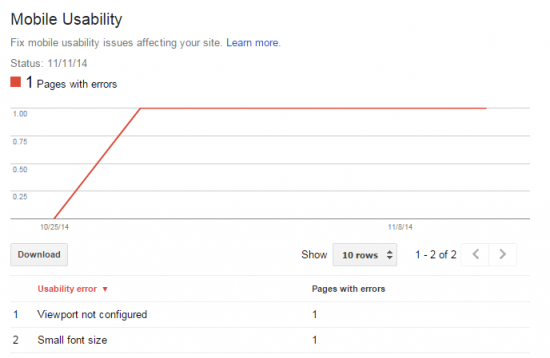 A couple of weeks ago Google added a new report within Webmaster Tools – the Mobile Usability report. This new report is automatically available within your Google Webmaster Tools account (https://www.google.com/webmasters/tools/mobile-usability). Is this a sign of another algorithm change? Nothing has been said officially by Google, but reading between the lines this new report could be another indicator that mobile user experience performance might soon be a ranking signal in Google’s algorithm. Whether this will be the case or not we simply don’t know, but either way this new report is a useful feature that will enable us to monitor and improve mobile UX performance.